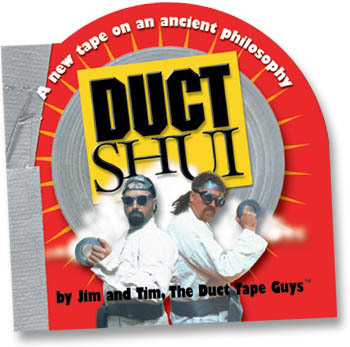 Stumbling headfirst into the ancient Chinese philosophy of feng shui, The Duct Tape Guys emerge totally bewildered-but not before creating their own breathtakingly stupid philosophy. DUCT SHUI, as they call it, reveals the secrets of achieving harmony and happiness, all through the use of you-know-what. With its terrific die-cut package (just to hold it feels peaceful, like a perfectly balanced roll of duct tape), DUCT SHUI is the newest work of inspired nuttiness from the guys who created the 365 Days of Duct Tape Calendars, The Jumbo Duct Tape Book, The Original Duct Tape Halloween Book, Stump the Duct Tape Guys, and other bestselling humor books. • In Feng Shui, wind chimes and bird feeders stimulate the flow of chi (energy) in a yard. In DUCT SHUI, attract birds by duct taping plastic decoys to a birdbath. • In Feng Shui, placing a wind chime in the front area of a home or office will summon people to help you. DUCT SHUI teaches that if you really want help, get some duct tape stuck in your hair and then pull hard-the screams will draw plenty of attention. • In Feng Shui, a wind chime over the stove will cure binge eating. DUCT SHUI says enough with the wind chimes already! You can cure binge eating by placing duct tape firmly across your mouth. Includes a Da Ktap compass (instead of the Pa Kua compass used by feng shui consultants), its very own mantra (Duct Tape, Duct Tape, Duct Tape, whispered until tranquility or sleep is achieved), and an ode to that essential influence: the couch. Think there’s no chi in duct tape? Just take a roll, tear off a piece, and hear the energy crackle! The Duct Guys stumble head-first into the ancient Chinese philosophy of Feng Shui. Totally bewildered, they explore their own theories on how to achieve harmony and happiness through the use of duct tape, thus creating their own breathtakingly stupid philosophy: Duct Shui. Click the > on the right to hear Tim using Duct Shui to improve the positive energy flow in the studios of Minnesota Public Radio's (MPR) morning show. April 8th is International Feng Shui Day. Celebrate by making a trip to your local bookstore and moving all of the copies of Duct Shui that you can find (generally in the humor section) face-out in the Feng Shui section of the store.